Albert Leo Stevens was born circa 1871 in Ohio is likely, despite later evidence to the contrary. He was known as Leo. Alois L. Jud and Anna Paulina Waldheger appeared in the US federal census of 1 June 1880 in Cleveland, Cuyahoga County, Ohio, at 996 Sheriff Street. Other members of the household included Albert Leo Stevens, Frank H. Stevens and Jerry Hofner. It is an educated guess that Frankie (age 5) and Joseph (2) are the future Frank and Leo Stevens. It is not clear whether Mamie (age 8) and sons Latte (9) and Alois L. (6) belong to Alois or to Anna. The following appeared on 2 September 1897 in The Milwaukee Journal: (Toronto, Sept. 2) Aeronaut Leo Stevens has successfully tested his new generator for manufacturing gas for his balloon, and says he will leave for the Klondike the latter part of this month. Stevens also declares that he will go to Andree's rescue provided his later experiments are successful. The Milwaukee Journal, 2 September 1897. 19th Century US Newspapers image accessed online at Godfrey Memorial Library, February 2011. He married Julia Zeifang, daughter of Marcus Zeifang and Ursula Stähle, possibly 1 October 1897. The following appeared on 16 January 1903 in the Niagara Falls Gazette: Mr. and Mrs. Leo Stevens, who have been in town since Christmas visiting Mrs. Stevens' parents, Mr. and Mrs. M. Zeifang of Pierce Avenue, returned to their home in New York this morning. The following appeared on 21 June 1914 in The Daily Herald: Dr. Rudolph Heym, Jr., of Cleveland, O., who has been out of medical school only a year and is now twenty-four years old, believes he has discovered a sure cure for heart disease. He is negotiating with a balloonist for the use of a large balloon, which he proposes to convert into a hospital and send up 2,000 or 3,000 feet in the air at night with the patients reclining on cots. The beneficial effects of a rarefied atmosphere on weak hearts are recognized, but the result is not permanent, so Dr. Heym proposes to give a supplementary treatement when the hospital comes down in the morning, before the effect of the trip alone has been dissipated. Albert Leo Stevens registered for the draft on 12 September 1918 in Douglas County, Nebraska, while living with his wife Julia at 5340 North 28th Avenue in Omaha, and employed by the US government as a balloon expert. His birthdate is recorded as 27 Sep 1877. He served as a colonel during World War I.
Albert Leo Stevens and Julia Zeifang appeared in the US federal census of 1 January 1920 in Omaha, Douglas County, Nebraska, at 5340 North 28th Avenue. Leo's age is recorded as 41 years. He was employed as an instructor by the government, according to the 1920 census. The following appeared on 3 February 1921 in The Idaho Statesman: (Omaha) Mrs. Julia Stevens, wife of A. Leo Stevens, chief civilian instructor in aeronautics at the Fort Omaha balloon school here and well known throughout the United States as a ballonist, filed suit for divorce in district court here Wednesday, charging cruelty. Mr. Stevens formerly lived in New York. The following appeared on 3 February 1921 in The New York Times: Mrs. Julia Stevens today filed suit in Omaha for divorce from her husband, Captain Leo Stevens of New York, Chief Balloon Instructor of the United States Army, founder of th Aero Club of America, holder of many balloon records and trainer of practically every balloon squad of American soldiers who reached France during the war. Mrs. Stevens charged her husband with cruelty. He and Julia Zeifang were divorced circa April 1922. He married Laura Carter on 6 July 1925. Albert Leo Stevens and Laura Carter appeared in the US federal census of 1 April 1930 in Otsego Township, Otsego County, New York. Leo's age is recorded as 48 years. He was an aeronautic pilot, according to the 1930 census. Albert Leo Stevens died on 7 May 1944 in Bardonia, Rockland County, New York. He was interred at Fly Creek Valley Cemetery, Otsego County, New York. The following appeared on 9 May 1944 in The New York Times: (Bardonia, N.Y., May 8) A. Leo Stevens, long prominent in aviation circles, died here last night at the home of his brother, Frank Stevens. He was en route to Washington from his home at Fly Creek in Otsego County. 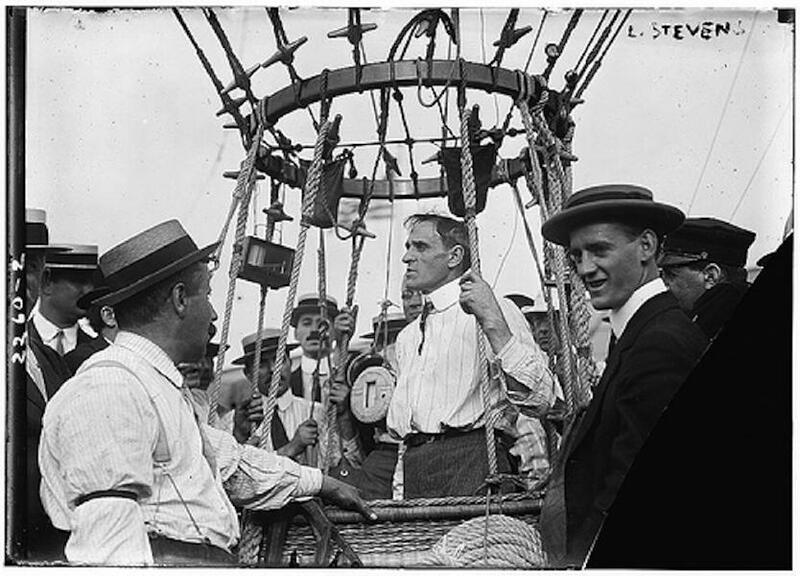 Mr. Stevens, who was born in Cleveland, sixty-seven years ago, was credited with numerous developments in parachutes and was said to have worked on the earliest dirigibles. He became interested in ballooning as a youth in Cleveland. He later gave balloon exhibitions, then moved to New York where he opened a parachute shop. During the first World War Mr. Stevens was an army balloon instructor at Fort Omaha, Neb., where he worked with Gen. H. H. Arnold, then a major. He later was an instructor at Scott Field, Ill. Mr. Stevens retired from business in 1927, but continued to experiment on various areronautical devices. He had been working with the Switlak Corporation in New Jersey. He was a member of various balloon clubs of France and America, and an honorary member of the Aeronautical Society of America. He leaves a widow, the former Laura Carter of Akron, Ohio. Nationally acclaimed as "Prince Leo the Boy Aeronaut" in the Gay Nineties, Mr. Stevens had made more than 3,400 balloon ascensions and on many occasions returned to earth dangling from a parachute. He was only 12 years old when he first went up in a balloon from amusement park, making the trip alone and without permission, after secretly entering the basket and cutting the mooring rope. An adventurous air ride, punctuated by bumps into houses and trees, ended with the boy tumbling into the shallow waters of a lake at Canton, Ohio. He became one of the first American parachute performers. In 1895 he excited the residents of Montreal by ending a jump on the spire of Notre Dame Cathedral. Three years later he landed in the Atlantic Ocean two miles off Long Branch, N. J. Another time his balloon exploded a thousand feet up and he had to make a hurried descent, missing by a short distance the gorge of Niagara Falls. A dirigible built by Mr. Stevens in 1902 made its first successful flight on Sept. 30 of that year, and over the Sheepshead Bay race track found another ship in the air. The rival was an imported replica of the one in which Santos-Dumont had flown around the Eiffel Tower, and the appearance of the two dirigibles at the same moment so disturbed the race track proceedings that the fourth race had to be postponed. The following appeared on 12 May 1944 in The Otsego Farmer: Several of the country's leaders in the field of aeronautics came to Cooperstown to pay final tribute to A. Leo Stevens, American pioneer aeronaut, whose funeral took place Thursday afternoon at the Ingalls Funeral home. The Rev. T. P. Hurd, rector of St. Mary's Episcopal church of Springfield Center, officiated, and burial was made in the cemetery at Fly Creek . . . Miss Anna H. Stevens of Bardonia and Lawrence H. Stevens of Forest Hills, L. I., a niece and nephew of Mr. Stephens : Several of the country's leaders in the field of aeronautics came to Cooperstown to pay final tribute to A. Leo Stevens, American pioneer aeronaut, whose funeral took place Thursday afternoon at the Ingalls Funeral home. The Rev. T. P. Hurd, rector of St: Several of the country's leaders in the field of aeronautics came to Cooperstown to pay final tribute to A. Leo Stevens, American pioneer aeronaut, whose funeral took place Thursday afternoon at the Ingalls Funeral home. The Rev. T. P. Hurd, rector of St. Mary's Episcopal church of Springfield Center, officiated, and burial was made in the cemetery at Fly Creek . . . Miss Anna H. Stevens of Bardonia and Lawrence H. Stevens of Forest Hills, L. I., a niece and nephew of Mr. Stephens : Several of the countr[sic], also were present. His only brother, Frank Stevens, was unable to be here. Mr. and Mrs. Rudolph Heym of Cleveland, O., first [sic] cousins, also were in attendance. . . [He] died peacefully in his sleep Sunday night at the home of his brother, Frank Stevens, at Bardonia. . . . Born in Cleveland, O., September 27, 1877, he was the son of Frank and Anna Stevens. . . . Surviving are his wife, the former Miss Laura Carter, Akron, O., whom he married July 6, 1925; the brother, Frank Stevens, at whose home his death occurred; one niece, Miss Anna Stevens, and three nephews, Lawrence, Leo and Vincent Stevens, the latter a member of the armed forces. . . .